The “Airport” series apparently launched the 1970s ‘disaster movie’ genre and I saw bits of the movies in this series as a kid but never the full films. Let’s see how they stand up today? To understand why the “Airport” series lasted for four films and the entire 1970s, keep in mind the monster hit nature of the first film. This was a big deal in 1970, grossing $100m off of a $10m budget. “Airport” was based on a novel of the same name by Arthur Hailey, an English author whose shtick was writing novels based on broad industries. For example, he had previously written “Hotel” and that had become both a 1967 movie and later a popular 1980s televisions series that was part of the Aaron Spelling empire. The center of the plot involved a Chicago airport manager named Bakersfeld (played by Burt Lancaster) and his pilot brother-in-law Demarest (played by Dean Martin). Both men were established early on as having affairs – Bakersfeld with a customer relations agent and Demarest with a stewardess. After things got rolling, Demarest was shown as piloting a Boeing 707 out of Chicago that was bound for Rome. A major sub-plot involved a desperate man who planned to blow up that plane so that his family could collect on his life insurance. That sub-plot intersected with an elderly woman who had stowed away in a seat next to the desperate man. Complicating matters and raising the stakes, Demarest’s stewardess girlfriend was pregnant. When the bomber’s plot was discovered, he was confronted and not entirely stopped. He still decided to detonate his bomb but did so in the airplane’s bathroom. The damage from the blast injured Demarest’s stewardess girlfriend and caused the plane to need to make an emergency landing. A snow storm had closed airports in the eastern United States, so the plane had to come all the way back to its origin airport in Chicago to attempt a harrowing landing. George Kennedy played an expert mechanic named Joe Patroni who advised on getting the plane safely landed. The Patroni character would go on to be the only linking element between the “Airport” films and his career arc would end up being very curious. We’ll get into that more later. Lest you think that “Airport” was simply popular with audiences, it won Helen Hayes an Academy Award for Best Supporting Actress for elderly stowaway role. It was also nominated for nine other Academy Awards, including Best Picture, Best Cinematography, and Best Costume Design. The costumes, by the way, were designed by the legendary costume designer Edith Head. “Airport” was shot in 70mm but outside of some nice long shots of a busy period airport, the use of that format wouldn’t do much to wow modern viewers. The wide-screen format did allow for some interesting split-screen shots. Devil’s Advocate: The side stories often only paid off a little bit, with multiple people having affairs and things mostly resolving before the ending. The star here was really the white-knuckled ending scenario. 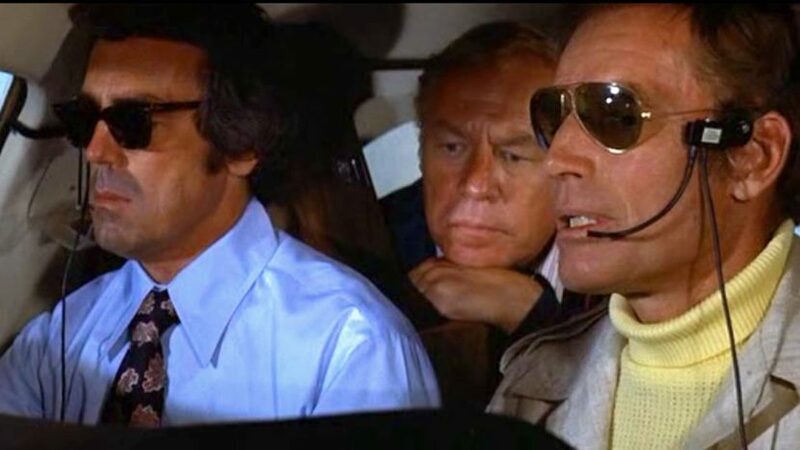 If you can somehow set aside the mockery that is ingrained from “Airplane,” “Airport” was a pretty solid thriller with some not-uninteresting melodrama. The basic idea for the sequel involved a 747 flying to Los Angeles being diverted to Salt Lake City due to weather complications. A salesman in his personal plane was also diverted but he suffered a heart attack whole flying near the 747. One thing led to another and the salesman crashed his plane into the 747’s cockpit. That collision left a gaping hole in the co-pilot side of the 747’s cockpit and pilots that were either dead or injured. Cue a stewardess who had to fly the 747 while a plan was hatched to somehow get a ‘real’ pilot aboard to land it. The circumstances led up to a bonkers scenario where a pilot had to be transferred down to the 747 from a jet helicopter, somehow getting through the hole in the cockpit. Obviously, the effects didn’t stand up to today’s standards, but I give them a pass simply due to the nutso idea. George Kennedy carried over his character of Joe Patroni from the first “Airport” film, with the master mechanic having seemingly taken a new job at a rival firm named Columbia Air. While Charlton Heston was billed as the main star, he showed up on the ground at the beginning and this disappeared for an hour. For most of the film he was simply and adviser whose girlfriend happened to be a stewardess on the flight and she (conveniently for drama’s sake) ended up being the interim pilot of the 747 after the accident. Heston and Kennedy eventually ended up in a chase plane, flying near the story’s central 747 while issues instructions via radio. Of course, Heston got to be the big hero at the very end, doing the whole air-to-air zip-line bit. Amogst the ‘name’ actors who appeared as passengers, Gloria Swanson, who many might recall from “Sunset Boulevard,” played herself as the ‘movie star’ on the plane. She was entertaining in what was her final film role. Despite the success of “Airport,” the producers apparently went cheap with this sequel and somehow made it for a mere $3m per IMDB. It didn’t make as much as the first film, but it still pulled in an impressive $47m. Devil’s Advocate: It was hard to take this film too seriously in a post-“Airplane!” world given how it was the most heavily-referenced from this series in that spoof. That said, as gonzo as some of the ideas seemed at times, it was that “Are they really going to do this?” nature that made it hard not to keep watching. Although “Airplane!” is known as having been based on “Zero Hour!” (1957), a lot of the details of that spoof also came from “Airport ’75.” In particular, the bits about the nun(s) and a girl in need of getting to a hospital came directly from this film. In fact, a scene with the nun playing the girl’s guitar was so memorable in “Airplane!” that it was hard to take seriously in “Airport ’75.” Also, the idea of there being ‘no one left to fly the plane!’ came to mind. Granted, I bought the hysteria of the stewardess who got involved in the flying. In the face of the cockpit having a giant hole in the side of its co-pilot area, there was only a slight breeze seeming to come into the cockpit. The series continued to get even wackier by the third entry but I kind of liked the craziness of the premise for “Airport ’77.” It involved an airliner crashing in the Bermuda Triangle. The crash came about due to a botched hijacking. Corrupt employees of the wealthy Philip Stevens decided to steal valuable artwork that was being transported on a plane down to Stevens’s Florida estate. After taking control of the plane via use of a sleeping gas (! ), the hijackers tried to avoid radar by flying low into the Bermuda Triangle. This move proved to be a bad idea since the plane clipped an offshore oil derrick and crashed into the ocean. The plane sank into the water, but its pressurized cabin kept the passengers alive. At least, the passengers who had not died in the crash, since most of the hijackers had perished. Still alive was the co-pilot and lead conspirator, Bob Chambers along with the plane’s honest pilot, Don Gallagher. Gallagher realized that by being off-course, any search attempts would never find the plane and the group worked to release a dinghy. The Navy soon arrived at the crash location and were able to briefly bring the plane back to the surface. The key passengers survived the ordeal and the remaining hijacker, Chambers, died when the plane’s cargo hold unexpectedly burst open during the rescue. The ‘all-star’ cast included many then-past-their-prime types, including James Stewart, Joseph Cotten and Olivia de Havilland. Jack Lemmon played a plane’s main pilot, Gallagher, and Christopher Lee showed up as a philandering passenger who died while attempting to get the dinghy into position. Stewart played the wealthy Philip Stevens character and he, along with George Kennedy (back again as an aircraft expert), spent most of the movie hanging out in Florida but did get a boat ride at the end. They were largely involved simply for a handful of ‘concerned about the search effort’ cutaways. Lemmon was largely the ‘hero’ of the film. Devil’s Advocate: They had me at ‘Underwater in the Bermuda Triangle.’ The science behind the film wasn’t something that one could think very hard about and the usual convenient circumstances applied. That said, the plot involving the hijackers and the resulting underwater situation kept my attention and was suspenseful. The ‘all-stars’ didn’t have much to do but it was still fun to see them in later career work. James Stewart was nearing the very end of his big screen career and, despite only being 70 years old, looked weathered. This was a reminder of how today’s aged stars have all kinds of ways to continue to look young at advanced ages. Presumably he got a nice paycheck for a couple of days of work while vacationing in Florida. There were claims that the Navy rescue sequence was accurate, at least as far as it being like a submarine rescue. I always thought that the Concorde was a pretty cool airplane and apparently the producers of “Airport ’79” agreed. Unfortunately, they put this great plane into a movie with a very convoluted plot. I’ll try to simply things, since the movie involved a couple of trips across the Atlantic Ocean amid all kinds of corporate espionage and a lot of characters who happened to know one another. 1970s model-actress Susan Blakely played a reporter who was having an affair with the head of Harrison Industries, played by Robert Wagner. Harrison Industries was a big weapons contractor, sort of like a modern-day Lockheed. One of Wagner’s employees leaked to Blakely that Wagner was approving illegal arms sales. After she questioned her about it, Wagner decided to kill Blakely in complicated fashion. She was slated to fly on the Concorde as part of a pre-Olympics ‘goodwill’ flight to Moscow and Wagner had a ‘malfunction’ during a drone test very nearly destroy the plane. When that ploy failed, Wagner had a fighter jet scrambled that also didn’t get the job done. The fighter did cause damage to the Concorde’s landing gear though and that resulted in it having to land on a ski slope in the Alps. Lest we forget to pepper in George Kennedy as the same Joe Patroni character seen in the past three “Airport” films. Patroni’s career arc was baffling though, as he was an expert mechanic in the first film and an executive in “Airport ’75,” then a consultant in “Airport ’77.” Here we were in 1979 as a newly-trained Concorde pilot, seemingly working for yet another airline. This installment featured plenty of airplane action but the arms dealing plot robbed it of some of the survivalist charm that was at the forefront of the other films in the series. That said, the ending, involving a harrowing landing on a ski slope did deliver. All told though, this felt like a haphazard movie. It was a sequel too far too fast. The finances involved in the production of this film told the story of why the “Airport” series ended with this installment. It was produced at a cost of $14m – the highest of the four films in the series – but only made $13m, the lowest gross of the series. All that said, I’d like to highlight one infamous scene: Kennedy was co-piloting the Concorde as it was being pursued by a missile and he tried to fire a flare gun out of an open (!) cockpit window to distract the missile. As crazy and illogical as that might sound, Kennedy managed to drop the gun and the flare went off inside the cockpit! All manner of mayhem ensued. The “Airport” series suffered from sequel fatigue and was then buried for good by the parody “Airplane!” There has certainly continued to be a place for airplane disaster films, as more-recent works like “Sully” (2016) proved. This genre largely moved to made-for-television movies in the 1980s though and it has mostly stayed there ever since. As a snapshot of the 1970s, a showcase for fading stars, and a sampling of the 1970s ‘disaster movie’ boom, one could still do a lot worse than these “Airport” films. Note that I’d rate all four of the “Airport” films a general 2 out of 4 if only because they were quite watchable despite having some serious flaws in logic. Maybe a 1.5 for the last one, but it still not a total waste of time given how darned goofy that scene was with the flare gun. In all cases, there was often over-the-top questionable science but that’s part of the fun though, right?